After days of of trying to find a solution(unsuccessfully), I've decided to turn to the collective wisdom and experience of the community for help. I'm relatively new to email development (but not to web development), so my hats off to all of you. I have a template that displays correctly across all desktop, web and mobile clients, except for the Gmail App for Android. 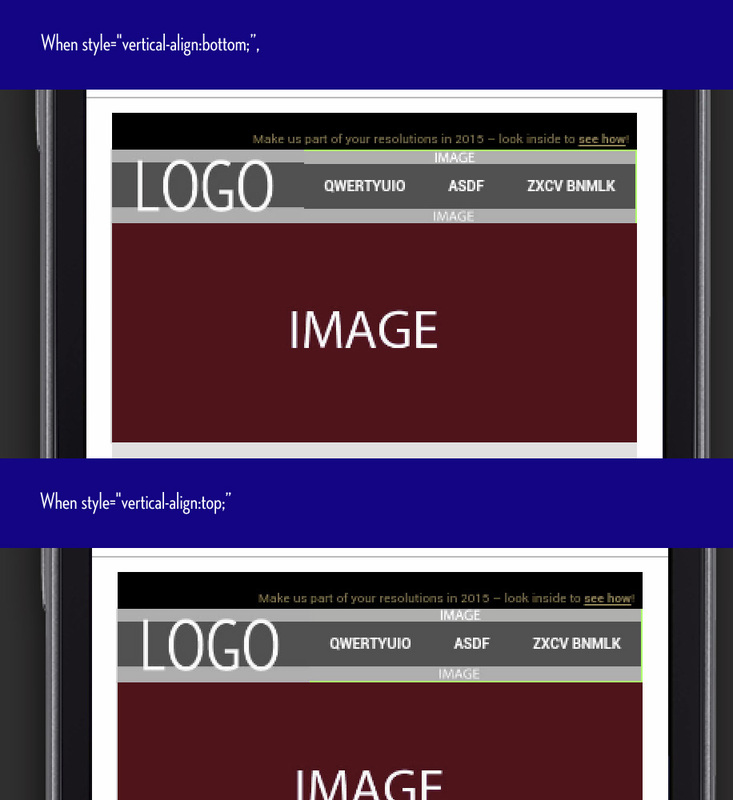 I have a nested navigation table (which consits of a top image, the navigation itself and bottom image). For some reason the Gmail App for Android displays a horizontal and vertical gap around the nested navigation table. The nested table should span the width(380px) and height(85px) of the containing cell, but doesn't. This gap only appears in the Gamil App for Android. I've attached a jpg as reference. I added a green background color to the table cell so you can see the gap issue. If I set the containing table <TD> tag to style="vertical-align:bottom;", the gap appears at the top of the nested navigation table. This causes a mislaignment with the logo. If I set the containing table <TD> tag to style="vertical-align:top;", the gap appears at the bottom of the nested navigation table. The table is aligned with the logo, but now I have a gap between the bottom navigation image and main content image. I also have a gap on the right side of the nested table (since thecontaining <TD> tag has align="left"). I've also posted the entire code under the image, but the nested table issue appears in the "Preheader and Navigation" section. Thank you for your time and guidance. George. Hi George - I'm having the same issue. Unfortunately, I have no answers for you. Has anyone else found a solution for this? I could only hide that gap by moving the table with margin-top: -2px. It seems to be working. The Gmail App for Android can sometimes render widths and spaces differently, I've found in my experience. It could be that an image in that top section is "breaking" the layout slightly. Have you tried adjusting the widths/heights of the images or logo to see if that makes a difference? I know I've had to adjust image sizes after building emails because some apps and Outlook tends to render the sizes weirdly different. it can be even with just a background color. Iphone also has it. Hi Ann - If I ever find a solution, I'll let you know!